Dream Clean and Calm Balm, a great duo for acne issues. If you or the young ladies or gents in your home are dealing with acne breakouts, here’s a collection that’s the duo for acne. Two products cheaper when purchased together as a collection. Yes, it’s time to put out your feeders! Some sites on hummingbirds are saying the red coloring are harming some and making them sick. The red feeder will draw them. You do not need red dye to draw the hummingbirds. A healthy hummingbird feeder recipe. * Store remaining mix in fridge for 7 to 10 days. Do not substitute sugar. Do not add red nectar, red dye, honey or anything else. Boiling water not only kills most bacteria and viruses, it also removes many other microorganisms and some chemicals. If you choose to use non-boiled water, please discard all nectar after 24 hours. * 88°F and up: Clean feeder and replace nectar every single day. * Cloudy nectar indicates bacteria, which is harmfull. ?Discard nectar, clean the feeder and add fresh clear nectar. * Black residue indicates mold, which is harmful. ?Discard nectar, clean the feeder and add fresh clear nectar. Yes, if you haven’t put out your feeder, now is the time! Not too far from here there are people facing giants and losses no one should have to bare such as losing/mourning the loss of their spouse, child, losing their home due to medical & burial expenses, saying “til we see you later” to a grandparent whose meeting Jesus tonight or met him recently, or a little girl going through major life changes such as “no mommy” to kiss her goodnight, read to her a favorite bedtime story or share what happened at school today because her mommy died and scared her now guardian may die, too. Not too far from here there are those needing comfort, peace, and strength to face the continual GIANTS that keep occurring. There are those battling sicknesses, death, the loss of property, the empty nest syndrome, seniors who sit home every day hoping someone will stop in for a visit or a call with complete presence from their children, grandchildren, or neighbors, the loss of a job, fellow co-workers who out of jealousy make going to work so unbearable, students being left out of activities-last to be picked-picked on-laughed at/made fun of- yes all forms of bullying, adults who use or demean others in the workplace/church/community, teachers needing lots of prayers as they’re expected to not only teach curriculum but behavior/respect/good daily health/hygiene habits/right over wrong/how to deal with anger/everyday issues responsibly/etc, and for others, financial setbacks, looking for love and attention in all the wrong faces/places. Not too far from here, there are teens afraid to smile because they need braces the family can’t afford because of finances, income, or heavy medical expenses of their other child. Not too far from here, there’s a child just wanting their Dad/Mom to be present in their life, if just once a month. Not too far from here, parents of blended families are trying so hard to bring unity among the children and other parent(s)-for the well being of all-especially the children. Not too far from here, there are a lot of teens/adults needing Jesus. Not too far from here there are young boys needing a father figure/a male mentor. Not too far from here, there are young girls needing a mother figure/a female mentor. Not too far from here, there are parents missing their adult child(ten) in their lives. Not too far from here, there are people facing all types of addiction(s)/strongholds, and families battling to help them. Not too far from here, there are law enforcement, emergency responders, firemen, and our military who are risking their lives to save others while their spouses/families are asking God to protect them. Not too far from here there are spouses and children dealing with the day to day issues of being a spouse/parent as their parent returns home from military service-all trying to deal with the mental/physical scars of war. Not too far from here, there are relationships crumbling. Not too far from here there are homes, churches, communities, states, and nations crumbling. Reach DEEP into your heart and Listen to your heartstrings. PRAY! There are so many good people and blessed people in our day to day lives. There are also people who battle for control to be numero one, which could be from having been numero one in the lives of all they’ve ever known, needing to be in the limelight because they’ve had to fight disabilities others didn’t, or because they just don’t know Jesus, because without HIM/HIS PRESENCE, there’s no true JOY and you’ll use any or all means available to be liked, get praises, etc. Since they’re no substance to such, they still climb. There are so many people facing their own Giants. Let’s pray for all these in need! God knows the hearts and the needs. Prayer is life’s Internet-prayer is bringing the spiritual world and the physical world together so they can overlap. One could pray nonstop for the needs around them in they would “open their eyes” and “open their hearts”. There’s needs all around us. God is love! It’s God’s mission as a missionary God to bring about the global purpose/COVENANT HE MADE WITH ABRAHAM! It’s the common thread throughout the Bible from Genesis to Revelation. Praying without ceasing isn’t to start praying and not stop. It’s to remain in a state of prayer. Be prepared to lift prayers throughout your day. If someone asks for prayer, stop and pray right then for them. It’s that moment in asking they are needing it more than ever. It’s also later you may get so busy in your life, you forget. Don’t fall captive or be baited in Satan’s trap. Pray that God works through the Bait of Satan and the offenses you’re holding on to that aren’t yours, may not be the truth, as could all stem from one or two and/or who through disabilities, jealousy, personal goals, intentionally or unintentionally may just be Satan’s Bait to divide, destroy, and/or create enough of a crack that others are hurt and/or stops needs from being met, as Satan smiles and God weeps. Praying! Won’t you join me? Treasure the physical, mental, and spiritual life-all three are needed to be healthy! 1 in 5 children in America struggle with hunger, and when school lets out for the summer millions of children might not know where their next meal will come from. Many children depend on the breakfast/lunch received at school and others depend on weekend nourishments from the backpack buddy program offered to many schools for their students, provided by churches and other civic groups in their area coming together to meet nutritional/hunger needs. 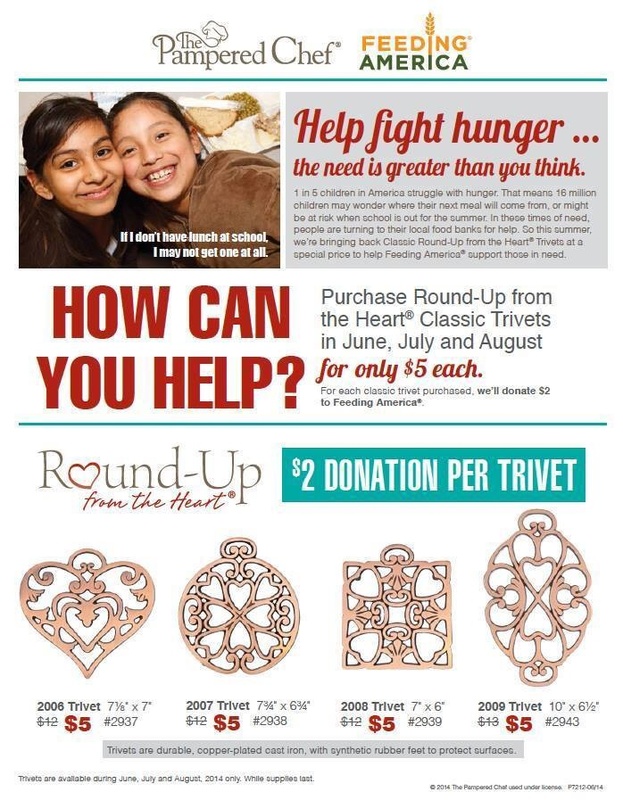 In June, July and August help support those in need by purchasing the Classic Round-Up from the Heart® Trivets. $2 from each $5 Trivet purchased will be contributed to Feeding America® to help provide meals to those in need. 4 of the $5 trivets = $8 to Feeding America = 72 meals being provided through the local food banks. The trivets make beautiful wall art/decor for the kitchen, nice gifts for any occasion, and are the perfect protection for the countertop or table for your hot dishes. You can order from my website or inbox me. http://new.pamperedchef.com/pws/getyvonne/guest-landing/8874183834779 , if local to me, this link the items can be shipped to the host/which the order will come to my house & I can get your order to you. If not local to me, you can use the same link but be sure to click the tab to have shipped to your address. If in doubt about shipping to your address through the online show, you can inbox me or type in the URL, www.pamperedchef.biz/getyvonne to place an individual order, not part of a show order, which will automatically ship to your home. Remember, the food bank in your own backyard/county will be depleted during the summer months with all meals-breakfast, lunch, and dinner- dependent on the food banks because schools are not supplying the children their first two meals of the day. By placing the individual order if you’re outside Lenoir County, the money will go to the Feeding America Food Bank in your county! Order as many as you would like of any or all the trivets to help the children have sufficient food this summer! So many of my friends received some snow in the past couple days, while others just received the freezing rain or colder temperatures than normal. Please be careful as you’re out and about. Bundle up, stay warm and remember whether walking or riding, there could be patches of ice, especially in shaded areas. For my friends with snow, while helping your children or the children in the neighborhood build a snowman, you might discuss the “meaning of the snowman”~copied (author not known, on a cute snowman given to me), sharing about God in a very fun and natural way. The white snow represents God’s forgiveness of our sins. The circular snowballs show the everlasting life God promises us. The carrot nose shows us that God has given us the Earth and all living things. The black coal mouth reminds us to give God praise. The scarf keeps us warm, just as God’s love does. The top hat reminds us to honor God above all things. The twig arms are open to hold us the way God does when we need Him. After building the snowman, join together for some hot chocolate that doesn’t take tending to every minute. Put it in before going out for your FUN in the snow and return to a crock pot filled with some delicious chocolate! Cook milk, cream, and chips in crock pot for 2 hours- serve hot with whipped cream on top. I’ve had so many people to ask me about the great smelling soup I have been taking to school for lunch and/or talked about while out and about. It’s easier to post the article with the recipe than retype the entire recipe—the bolded and parenthesis ingredients are what I used to make my variation of the soup. This soup if eaten as per instructions is intended to help flush fat from the body. I decided to try it once a friend said she tried it while back and forth at the hospital with her husband in rehab, not eating the soup as instructed but eating it as she could. She did lose some weight but more importantly, her cholesterol was getting high, and with this soup, it came down. It’s hard to believe a soup high in protein that’s suppose to be good for you, can be delicious. I was even afraid to taste it, but to my surprise, it was delicious. If you’re a vegetarian, no problem. There’s a sentence that tells you what to add or delete, too. Based on my original Fat Flush soup recipe, a “new and improved” Fat Flush Soup Diet is back — right in time for the 2012 (2013) weight loss season! The mouth-watering recipe — with delicious variations — was originally featured as a cover story in a major national women’s magazine and we have been receiving rave reviews from all over the country ever since. A wonderful meal in a bowl, the basic soup recipe contains hearty and warming veggies, beans, and lean protein with spices like cumin, cayenne, cilantro and fresh garlic to seriously boost flavor appeal and enhance cleansing power. Really perfect for a spring cleaning boost! All you have to do is savor the soup twice a day—preferably at lunch and dinner — with a small salad or bowl of steamed non-starchy veggies. Throughout the day, sip on herbal teas (dandelion or peppermint tea), lemon and water, plain water or unsweetened cranberry juice with water (1 ounce of juice to 7 ounces water) so that you are consuming at least 64 ounces of liquid daily. Start the day with a protein rich breakfast in the morning. I would personally suggest a smoothie made with brown rice and pea protein powder (20 grams of proteins per serving) to help kick-start glucagon, the protein-based hormone that mobilizes fat from storage. Or choose any of the easy protein-packed breakfasts, you will find in Phase 1 of my book, The Fat Flush Plan. (Of course the protein you consume must be healthy — organic if possible — and not pumped up with hormones or antibiotics.) Critical to both phases of liver detox, this star performer is equated with beauty since our skin, hair, and nails are 98 percent protein. Protein helps make the powerhouse antioxidant glutathione; creates vital enzyme to zap toxins, and maintains energy levels. Protein is essential for weight loss because it can produce the pancreatic hormone known as glucagon which accesses stored body fat for energy. And since the body can’t store protein, it is so very essential that we get the right amount daily (at least 20 grams per meal) — which is what the soup provides! Having low protein levels increases our desire for carbs (like sugar) which contribute to a rise in insulin — the fat promoting hormone. The filling, high fiber beans — either pinto, garbanzo, or black — contain anywhere from about 10 –20 grams of fiber per serving, which will help regulate blood sugar and sweep toxins out of the system by fulfilling the 35 fiber grams per day dietary recommendation. 2012 Fat Flush Soup–bold and parenthesis is how I cooked mine. I found it helpful to use my Pampered Chef manual food processor to chop the ingredients so they were ready at each phase of cooking. With the manual processor, I processed til chopped, not pureed. I also added a medium carrot chopped when it was time to add the veggies. *For vegetarian option, omit meat and add another can of beans. In a (used my 12 qt. Pampered Chef stockpot, but you could use one 8 qt) saucepot over medium-high heat, cook oil 30 seconds or until heated. Add beef, turkey or chicken. Cook 5 minutes or until cooked through, stirring occasionally. Remove from skillet; drain, if desired. In same saucepot, cook onions, peppers, zucchini, mushrooms and garlic 5 minutes or until vegetables are crisp-tender, stirring occasionally. Stir in next 6 ingredients and cooked meat. Add up to 1 cup water to thin soup, if desired. Cover; bring soup just to a simmer (do not let boil). Reduce heat to medium-low. Let simmer 20 minutes, stirring occasionally. Stir in cilantro and parsley. Cover; let simmer 5 minutes more. Garnish with shaved Parmesan cheese, if desired. Soup can be stored up to 5 days in the refrigerator or frozen. 2 to 3 cups (makes 10 to 12 cups) But the basic soup recipe goes on to the next level by individualizing weight loss and recommending very special ingredient “add-ins” that address the top four weight gain triggers most commonly experienced by frustrated dieters: a sluggish thyroid, burned out adrenals, a toxic liver, and yeast overload. What has made this Fat Flushing soup especially popular is that you can tweak the basic recipe to speed weight loss if you are a thyroid type and are tired, constipated, depressed or experience extremely dry skin; an adrenal type and are frequently stressed, crave salt, and lightheaded; a liver type, plagued by headaches and bloat; or are fending off yeast and are constantly craving carbs and have frequent GI distress. Mix and match the various recipes and eat the soup that is designed to quell any of the symptoms you may be experiencing. All the tweaks blend beautifully together! To boost the thyroid, simply add two teaspoons of seaweed gomasio to provide thyroid nourishing iodine. Also add 1 cup of potassium-rich zucchini. For adrenal healing, add 1/2 teaspoon pink Himalayan sea salt for added adrenal-supporting sodium and also add 4 to 5 cups of escarole and spinach for extra rich magnesium content. To help detoxify the liver, add 1 teaspoon of turmeric which is a potent anti-inflammatory that enhances the liver’s ability to filter toxins. And, for those fighting Candida or other types of yeast and fungus, consider substituting 1/2 cup grated daikon (a white radish) for the mushrooms — which can increase yeast in sensitive individuals. Double up on the yeast-fighting garlic (4 cloves) and add a small peeled and chopped eggplant which is rich in antifungal nutrients. If you are ready for a fresh start, but not sure how to begin, then my specialty soups and tailored supplements may be just what you need. It’s so easy because the soup can be stored in the fridge for up to 5 days or frozen ahead.